Here’s a truism: Every video platform is unique, like a snowflake. That means you can’t just upload the exact same video on six different platforms and call it a day. Thankfully, we’re here to illustrate the key differences between the YouTubes and Vimeos of the world for you. 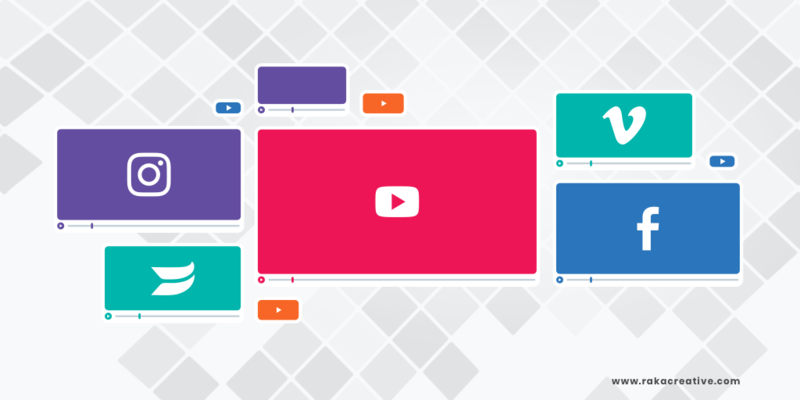 We aim to teach you how to conduct your company’s actions across these six key video platforms. Wistia is a video hosting platform strictly for sharing, which means you’re more likely to find educational videos than viral cat videos. You can also share your videos easily across a variety of digital platforms, which delivers all SEO credit to your website. Did I mention it’s ad free? Vimeo is somewhere between YouTube and Wistia in terms of style and capabilities. There are no ads and the player is customizable to your brand, which is a plus. You have the ability to search through videos, embed them within your website, and share them on your social accounts—drum roll, please—with no ads! Instagram is a not just a video platform. It is also one of the largest social platforms, and should be utilized with that in mind. Video content posted to Instagram is limited to 60 seconds, giving you little time to add value and captivate an audience. You’ll find many images and videos posted to IG redirecting users to the user’s bio pages to click a link posted to other forms of content. Live streaming technologies allow for Instagram users to engage with their audience in real-time. Whether that live stream is for content delivery or Q&A, high engagement is never a bad thing. Instagram’s addition of an in-app store allows businesses to add CTAs, as well. The phenomenon that is Snapchat is unique in the sense that your content always disappears within a 24 hour period, and can last mere seconds if you’d prefer it to. As a result, the audience isn’t buttoned-up businesspeople, but those seeking raw content that reveals what’s going on behind the curtain at your company. This platforms allows you to develop an intimate relationship with your audience and makes your brand more relatable. In an attempt to take over the internet, Facebook added a floating video player back in 2015. The result was millions of users endlessly scrolling through their video feeds, which means plenty of opportunities to have your videos seen. Due to short attention spans and other distractions Facebook offers, it’s important to keep your content short and visually appealing. Utilizing moving pictures and text can increase your video watch times, and keep in mind that Facebook videos are typically not the 5-minute how-tos you find on YouTube, but tend to be short captivating bursts of film packed with value. The live option for Facebook offers a highly interactive experience. This can be used to entertain or hold Q&As with your audience, with an end goal of engaging (and even converting) them. As the world’s second largest search engine, I’m going to assume we’ve all experienced the wonderful world of YouTube. This is where we learn to change our own oil, tie our shoes, and waste countless hours watching cat videos. Long-form videos tend to do the best in YouTube’s search, as watch-time plays a part YouTube’s algorithm. Live streaming is also available on YouTube with similar features to Facebook, but includes a donation button that allows users to donate directly to content creators. Don’t feel like you need an account on every single one of these platforms—because you don’t. Your goal should be to find out where your audience hangs out and have a presence there. Is it your site? YouTube channel? Facebook page? It depends on what you’re marketing and who you’re marketing to. Take a good look at your buyer personas and start planning content for their platforms. We recommend you make use of your company’s style guide to find your own unique video production and content creation methods, and to land on the platforms that matter. Now you have the gist of each platform, you can find the best video platform to suit your needs and get to creating content!